As of 28th August, it’s bags for life all the way. Tesco’s has become the latest major UK supermarket to ditch the 5p single-use bag in favour of the 10p bag for life. As of Monday 28th August, you won’t be able to buy the single-use bags from Tesco’s stores across the UK. Tesco’s decision to scrap the single-use bags has been praised by wildlife campaigners and environmentalists across the UK, and here’s why. Since the carrier bag charge was launched in England in 2015, Tesco’s shoppers have used 1.5 billion fewer single-use bags. But Tesco still hands out more plastic bags than any other major UK supermarket, according to the BBC, and is still currently selling more than 700 million each year. That’s a lot of plastic, so it’s great to see Tesco is jumping on the plastic-banning bandwagon. Every 10p bag for life that Tesco’s sells contributes to community projects, similar to how other supermarkets started making charity donations after the introduction of the plastic bag charge. Tesco has already paid out £33 million to more than 6,400 community groups across the UK. What’s more, the bags are made of 94% recycled plastic, so not only do they prevent more bags from being created and used, they also use up plastic waste. Cutting down on plastic bags being sold in store means that fewer bags will be winding their way into our seas. That means, marine creatures will be less likely to snack on the bags and find themselves washed up with a stomach full of plastic. Which is good news for everyone. “It is great to see major retailers moving away from disposable plastic,” said Louise Edge, senior campaigner at Greenpeace UK, reported the BBC. 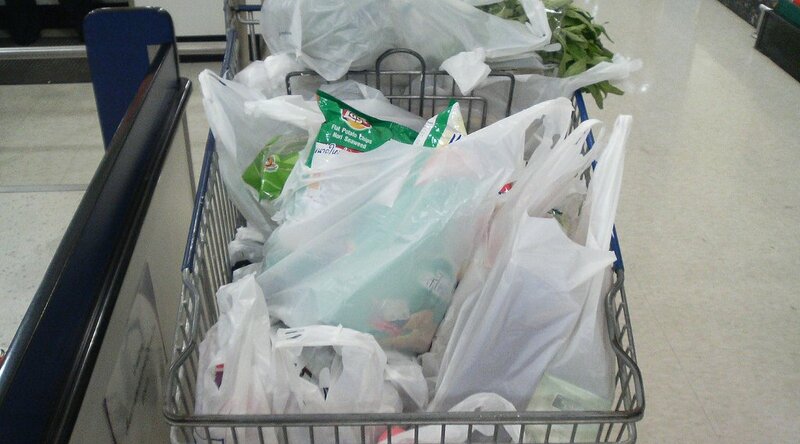 The fewer bags that are sold, the fewer that will end up in our country’s landfill sites. Did you know that it takes hundreds of years for a plastic bag to break down? It may be 5p extra at the actual moment of buying the bag for life, but it’s a bag for life. Tesco’s have promised to replace them free of charge when they get damaged. So in the long run, it’s an investment. A 10-week trial in Aberdeen, Dundee, and Norwich led to a 25% cut in bag sales, as shoppers either brought their own or switched to bags for life. As the scheme is rolled out nationwide, here’s hoping it sees the same level of success. Tesco’s decision is the latest step in the UK’s battle against plastic waste, after the 5p carrier bag charge was initially introduced in England in 2015 to reduce litter and to protect wildlife. It brought England in line with the schemes already in place across the rest of the UK and it had an immediate impact on shoppers. The year before the charge, the UK’s seven biggest supermarkets handed out more than 7 billion bags. That number fell to slightly more than 500 million in the first six months after the charge, according to the Department for Environment, Food and Rural Affairs. “The number of bags being bought by our customers has already reduced dramatically,” said Matt Davies, UK and Irish Republic chief executive at Tesco. People doing their shopping on Tesco’s online will still be able to receive deliveries in single-use bags after the end of store sales. Or they will be able to join the around 50% of shoppers who already choose bagless delivery. Sainsbury’s made a similar move when the carrier bag charge was first introduced.